Google first announced its Chrome Web Store at its I/O earlier this year and new details about the feature reveal the company’s big plans to influence and reach everything from TV to gaming and the web. The Chrome Web Store is a marketplace for HTML 5 apps and will allow users to purchase web applications from their Chrome web browsers. It is rumoured to release in October. Google held a detailed presentation at the GDC Europe where they also explained that contrary to its earlier announcement at the I/O, now Google will only take 5% processing fee from developers with no additional revenue sharing. This is a big discount from the usual 30% charged by the Android market and the Apple App Store. It is going to be a huge incentive for developers to develop and promote the web versions of their applications over their native counterparts. Google may make less money from this in the short term, but if it helps the web win out over native apps then it’s a decision that will pay off for Google in a big way. 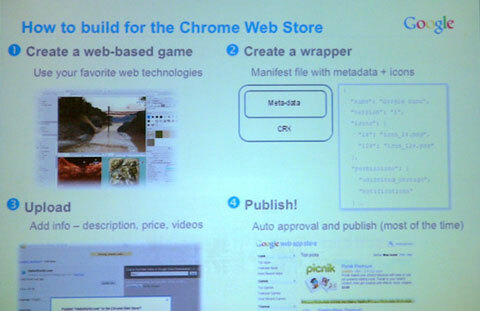 Photos of Google’s presentation slides reveal a somewhat same look and interface as the Apple App Store. App icons, categories and “Top rated games” are all part of the Chrome Web Store design. A new section named “Apps your friends like” is also seen in the photos. The store will launch with support for free trials, subscriptions, and other in-app payment platforms. At launch you’ll be able to purchase apps from anywhere in the world using Google Checkout, but only with US dollars in the beginning. Support for other currencies and in app-transactions will be introduced in the first half of 2011. Google is also getting ready to launch its Chrome OS later this year and the Chrome Web Store will be one of its key selling points. It can help Google in competing with game consoles through integration with Google TV. It could even become the app platform for the much rumoured Google Me service. Whatever it’s going to be, it won’t be small, just like its creator. Next post: Turn Any Surface In To A TouchScreen, It’s Like Magic!